Bar-B-Q Chicken Dinner $11.29 – A tender 1/2 chicken, slow cooked over our wood fires and basted with our sweet sauce. All White Meat add $1.00. Rib City® Riblet Dinner $11.59 – Delicious and tender, these rib tips are basted with our sweet barbecue sauce. St. Louis Style Ribs $14.79 – If you like traditional Spare Ribs, you’ll love these closely trimmed ribs. Something you can sink your teeth into! Bar-B-Q Pork Dinner $10.59 – Slowly cooked to perfection over Blackjack oak, sliced thin & piled high. Rib City® Pulled Pork Dinner $10.59 – Smoked on site, pulled and mixed with our Rib City® Tangy sauce and unique spices. Smoked Turkey Dinner $10.59 – Boneless breast of Turkey sliced thin, served moist and tender. Baby Back Rib Plate $9.49 – 1/2 Rack, so tender the meat just falls off the bone. 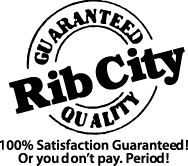 Rib City® Riblets Lunch $8.99 – Tender rib tips basted with our sweet barbecue sauce. Beans and Franks (The Gas Station) $6.99 – Two 1/4 pound all beef hot dogs smothered in our baked beans.